Paper Crafts by Candace: Ann's Surprise Birthday Bash! Hello! And Welcome to Ann's Surprise Birthday Bash! This blog hop has been put together to celebrate Ann's birthday!! For those of you who don't know, Ann is the owner of SVG Cutting Files. She also creates all the files we use on our fun hops that you hoppers get for free!! Ann does SO MUCH for so many other people that we have decided to put together this surprise blog hop just for her to help celebrate her Birthday! No free files on this hop but there are some prizes and fun involved with this bash!! We will pick two winners from those who comment and follow all the blogs in this hop.. Anyone who places an order this weekend (no matter how big or small) from SVG Cutting Files will be put into a drawing to win two Jaded Blossom stamp sets of their choice!! 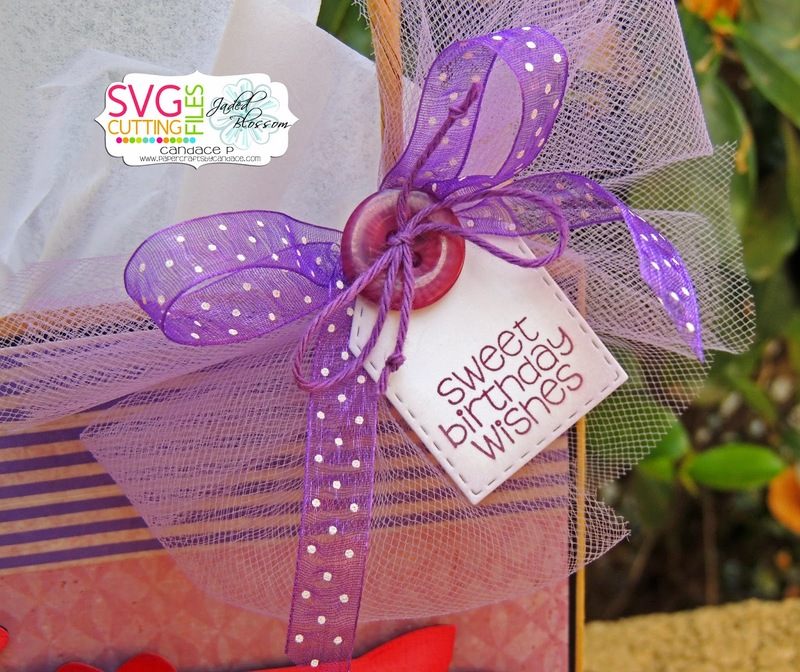 Make a Birthday Project (for Ann if you want, or for anyone else) using SVG Cutting Files and upload it to the SVG Cutting Files Galleria on facebook. Upload your photo by 10/31! One winner will win a $25 Jaded Blossom Gift Certificate! Now on with the hop... here is what I created for Ann.. 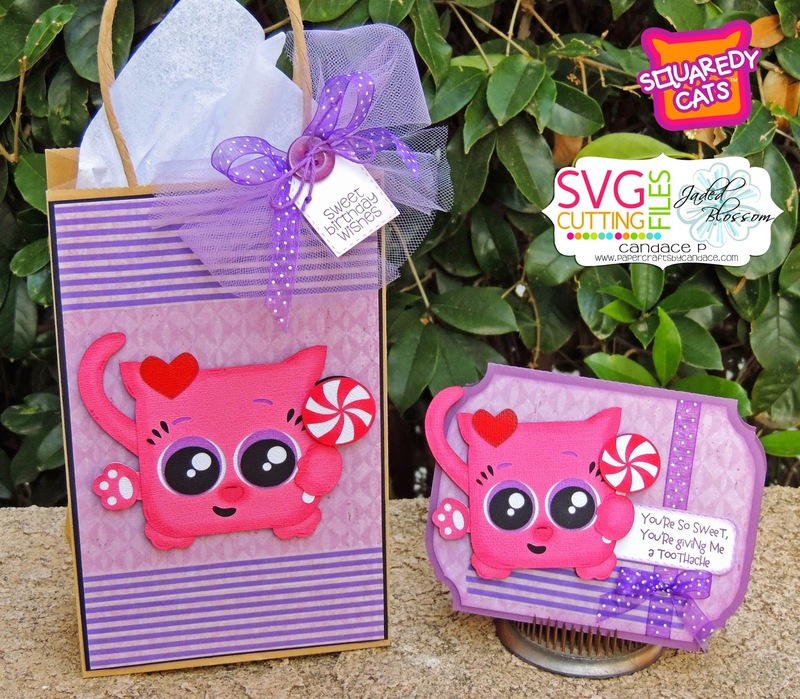 This is the NEW Squaredy Cat Candie that will be available Friday! I made a card and a matching gift bag for Ann. Here is a close up of the gift bag.. Here is the line up in case you get lost..
DON'T FORGET TO WISH ANN A HAPPY BIRTHDAY! That is cute. Happy Birthday Ann. Wishing Ann a very happy birthday!! 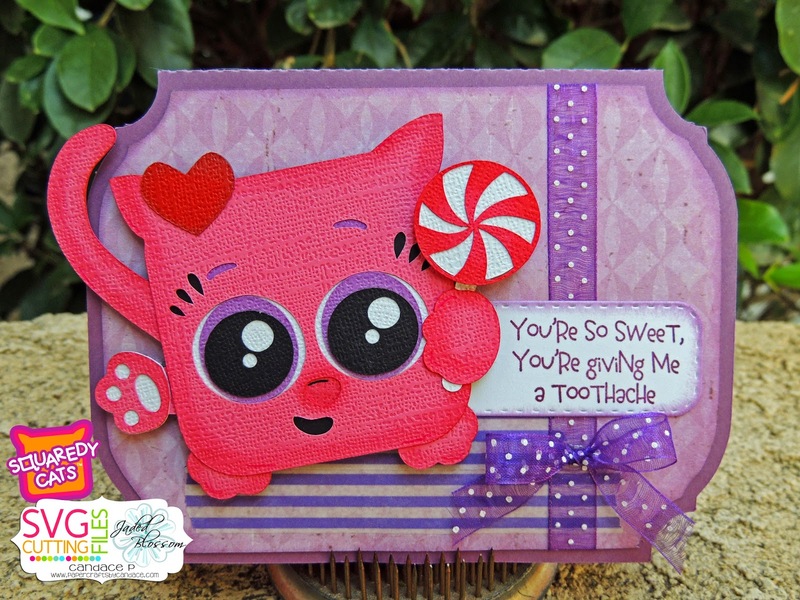 Your project is so cute -- love the colors!! I love your gift bag and matching card. Oh my that is just the cutest gift bag and card set ever. Love the sentiments you used too! Super cute gift for Ann, thanks for letting me HOP with you all to the Birthday Cake. Someone said there would be cake, yeah where is the cake? LOL j/k you guys are so great to pay tribute to Ann this way, I am just happy to be able to share in it with you all. This set is so super cute and I LOVE that amazing bow on the bag! So cute! Happy Birthday Ann! Adorable... I wasn't in love with the squardy cats at first but all the creativity you all have displayed is making them grow on me! such a cute little kitty! thanks for sharing! Super sweet!!! Love the sentiments. Happy Birthday, Ann! The bag and matching card are amazing! this is such a cute bag for Ann. I know she's going to love it! Happy birthday Ann! Happy Birthday Ann! Have a wonderful day. Very cute and sweet card. So sweet :) And cute too!! Love this! What an awesome gift! Oh my goodness!! Going to HAVE to have this squaredy cat!!! The projects are adorable! Awww....what a fun gift set! Such a great birthday gift bag and card. I love the colors and the Squaredy Cat is adorable. I love the peppermint sweet! Happy Birthday Ann. Happy Birthday Ann!!! 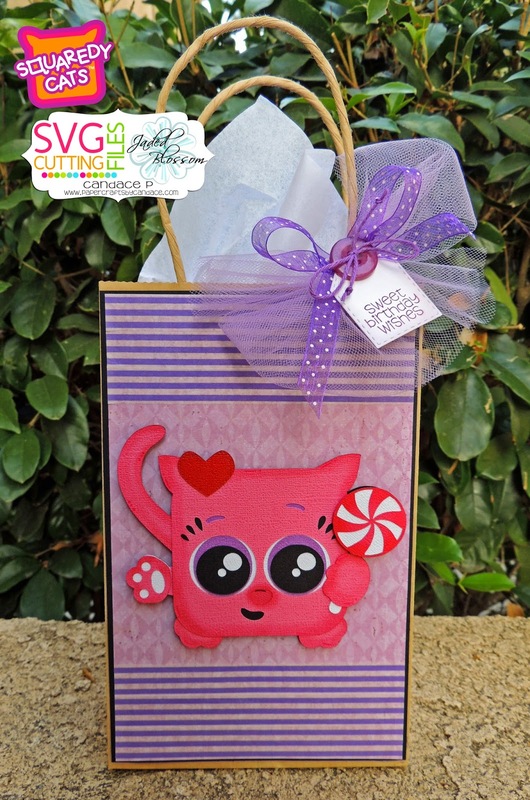 Super cute project..the matching card and gift bag couldn't be cuter! this is just adorable. Who wouldn't want to receive this?? So sweet! I would love to get this for my birthday! Happy birthday, Ann! Happy Birthday Ann! Love the project! Too Cute! Squaredy Cat is adorable. Awww that's a sweet lil' kitty! Happy Birthday Ann! Thanks for all you do! May your blessings be bountiful! This is soooo adorable!!! The peppermint is awesome love love love. Happy Birthday Ann and Thank you for being such an awesome artist!! Cute duo. Colors are very cheery. Very Cute - Happy Birthday! This hop is a lot of fun for a fun gal. Adorable! !Your card and matching bag are super cute. I love your bright colors and all the details. Great job! Absolutely Adorable!! Love this birthday ensemble!! pretty purple and adorable image! Love the colors in this one! Adorable! super cute of course ...... but a little odd for a PINK cat perhaps she may forgive you LOL ! Cuteness all over the place! So cute, love the kitty. Love the bag and the card. I have to purchase some of the sqauredy cats. They are sooo cute! Love your card and bag. Happy birthday Ann. This is so cute and a great reason for a hop. Very cute! Happy Birthday Ann!! Adorable!! Love the colors you chose! This is really cute! I love how you used the washi tape! perfect! I really like the color combinations. Good job. Omg, this is too stinkin' cute Candace! Will be looking out for this file :D HAAAAAPPY BDAY ANNIE!! this is so cute!! I just love the colors!! Happy Birthday Ann!!! Aww! Your bag is ADORABLE!!! Great Job! How cute! Love this cat! HB too Ann! THanks for all you do and share girls! Very sweet hop for Ann! Great treat bag and card. adorable. i love the bow and the button! cute that you made a matching bag to the card!! Happy Birthday Ann!!! Cute card!!! The card is very lovely. I love love love purple and this just pops so nicely. Cute - it makes me smile! Really cute! And so nice that you all organized this for Ann. Happy Birthday, Ann! Hope you have a wonderful day! Very Cute! Happy Birthday ANN!